MCWD is dedicated to providing clean drinking water to the 33,000 residents in our service area now and well into the future. Currently, our sole source of water comes from the Salinas Valley Groundwater Basin which supplies many other communities beyond our service area. In order to meet future demands, MCWD is already working to maximize how we use our existing supplies, researching potential new sources, encouraging conservation and investing in infrastructure to deliver advanced recycled water. As we work to balance future needs with supply, conservation and new sources, we must be ever vigilant to guard against environmental impacts such as saltwater intrusion into fragile groundwater basins. MCWD's groundwater withdrawals are about 3,200 afy — less than 1% of total annual basin withdrawals. MCWD owns and operates its production wells and does not purchase wholesale water supply. Through the Regional Urban Water Augmentation Program for the Ord Community (RUWAP), MCWD is exploring the most cost effective and technically efficient mix of advance treated water, conservation, desalination, groundwater recharge and recovery. 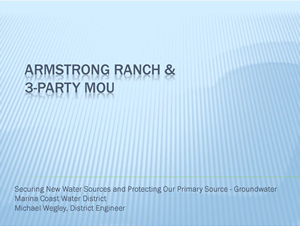 By partnering with the Pure Water Monterey: Groundwater Replenishment Project (PWM), MCWD is participating in a regional approach to provide advanced treated recycled water for commercial irrigation and other uses. MCWD is developing a 10-mile pipeline with PWM and the Fort Ord Reuse Authority to transport advance-treated recycled water to Ord Community area water users as part of the redevelopment of the former Ford Ord. Up to 1,427 acre-feet per year will be supplied for irrigating landscapes, public parks and other commercial landscaping. In addition to encouraging use of advanced treated recycled water, encouraging conservation, conducting regional supply studies, MCWD is also actively protecting current sources. MCWD has long worked to make the possibility of desalination a reality and has operated its own desalination project. 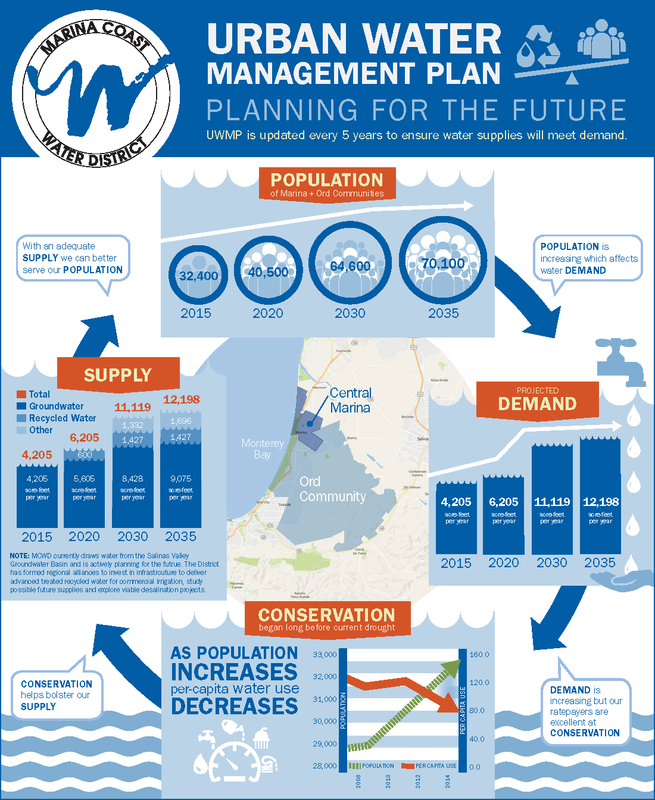 However, the proposed Monterey Peninsula Water Supply Project poses potential impacts that must be avoided. Analysis by a leading expert that has been corroborated by the Lawrence Berkeley National Laboratory demonstrates that the water being drawn by a test well for this project has caused a drop in the water table by 18 inches, which is significant. Furthermore, water demands within the district are already significantly below the state and regional averages due to aggressive water conservation practices. In August 2005, the Central Marina and Ord Community water systems were connected; integrated operations allow water to flow between the two systems to meet peak demands and improve overall services. The amount of water exchanged between the systems is automatically monitored and recorded. 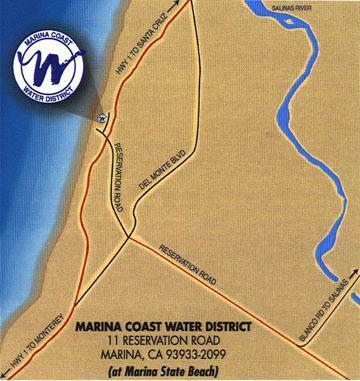 In July 2007, the California Department of Public Health approved the consolidation of the water systems as Marina Coast Water District Water System. Supply wells in Central Marina are from three deep groundwater wells located in the 900-foot aquifer of the Salinas Valley Groundwater Basin. Water is treated at each well site for disinfection and to remove the naturally occurring hydrogen sulfide that can sometimes cause odor problems. Supply wells in the Ord Community are from three groundwater wells located in the lower 180-foot and 400-foot aquifers of the Salinas Valley Groundwater Basin. Groundwater from these wells is also disinfected to ensure healthy and safe drinking water. Marina's desalination plant when running at full capacity can provide 300,000 gallons per day of potable water. Sign up to get the latest MCWD news and updates delivered to your inbox. Monday – Friday, 8 a.m. to 5:00 p.m. Copyright © 2017 Marina Coast Water District. All Rights Reserved.